Heirloom quality tree ornaments and collectables. Old world Santas based on legends and folklore from thirty countries. Christmas gift gallery containing work of WV artists. Live Christmas and Santa chat room. Ornaments, angels, lights, trees, wreaths, music boxes, and Christmas collectibles from around the world. Handcrafted miniature Christmas ornaments, Christmas trees, holiday decor, foods and kits from artisans all over the world. Ornaments, angels, lights, gifts, trees, dolls, wreaths, music boxes, and Christmas collectibles, from around the world. Gift registry, newsletter, calendar, and other store locations. Old World Christmas glass ornaments. Author, featuring the book 'Christmas Unwrapped: Visions of Christmas Reality' about life and love and the true meaning of Christmas. Includes information and additional writings. Featuring a range of jewelry, Christmas decoration and gadgets and tools. Christmas stockings, tree skirts and Christmas door stockings to replace the traditional wreath. Specializing in European glass ornaments, smokers, nutcrackers, animated musicals, and lights. Gifts for Christmas and around the year including folk art, toys for adults and children, candle holders, miniatures, music boxes, matchbox scenes, Noahs Ark and Christmas ornaments. Shop for European glass ornaments, smokers, nutcrackers, animated musicals, and lights, includes ordering and contact information. First quality pottery direct from Boleslawiec. Tableware, doll sets, and christmas items available. Old world Father Christmas pine cone figures. Handmade costumes of mainly natural fabrics. Signed, numbered, certificate of authenticity. Holiday decorating including stocking, wreaths, ornaments, candles and lanterns, trees, lights, and cards. Also offers letters and phone greetings from Santa. Artist Kitty Forseth creates olde world style papier mache artwork using antique German chocolate molds. Whimsical Christmas, Halloween and Easter, as well as everyday. Childrens picture book of winter celebrations around the world. Solstice, Christmas, Kwanza, Hanukkah, Las Posadas, Teng Chieh, Diwali, Soyal, Zagmuk. Ages 3-9. Handcrafted Father Christmas figures by artist Daine M. Hoffman. Offers Christmas ornaments and gifts for many occasions including new babies, families, and Christmas. Specializing in collectible Christmas ornaments and decorations, including Department 56. Products and accessories to make Christmas decorating faster, safer and easier. Various decorations from collectible ornaments, Christmas trees, and lights. Provides a tool for installing outdoor christmas lights from the ground. Limited edition Christmas decorations, numbered and signed by the artists. Offers handmade Christmas wreaths. Finished product or pattern. Specializes in hand-sewn felt Christmas stockings for persons of all ages. Suppliers of Christmas light displays, accessories, instructional manuals and animation kits. Fine Art Christmas cards produced from the collection of Christmas paintings by artist Bradley J. Parrish. Offers heart pins, pencils, and Christmas ornaments by Maureen Amos Jackson. Hand carved Christmas items Santas, angels, nativities, and snow people. If the business hours of Christmas at the Lake in may vary on holidays like Valentine’s Day, Washington’s Birthday, St. Patrick’s Day, Easter, Easter eve and Mother’s day. We display standard opening hours and price ranges in our profile site. We recommend to check out christmasatthelake.com/ for further information. 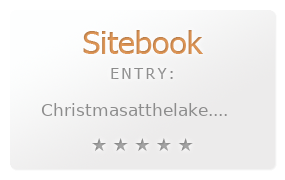 You can also search for Alternatives for christmasatthelake.com/ on our Review Site Sitebook.org All trademarks are the property of their respective owners. If we should delete this entry, please send us a short E-Mail.